Since I was a boy, in my early childhood, I always wanted to be a musician, and, thank God, I 1)made it. From my teachers, my family and my community, I had all the necessary support to become a musician. All my life I’ve dreamed for all 2)Venezuelan children to have the same opportunity that I had. From that desire and from my heart stemmed the idea to make music a deep and global reality for my country. From the very first rehearsal, I saw the bright future ahead because the rehearsal meant a great challenge to me. I had received a donation of 503)music stands to be used by 100 children in that rehearsal. When I arrived at the rehearsal, only 11 kids had shown up, and I said to myself, “Do I close the program or multiply these kids?” I decided to face the challenge, and on that same night, I promised those 11 children I’d turn our orchestra into one of the leading orchestras in the world. During the recent tour by the 4)Simon Bolivar Youth Orchestra of Venezuela of the U.S. and Europe, we saw how our music moved young audiences to the bottom of their souls, how children and adolescents rushed up to the stage to receive the5)jackets from our musicians, how the 6)standing ovations, sometimes 30 minutes long, seemed to last forever, and how the public, after the concert was over, went out into the street to greet our young people in triumph. This meant not only an artistic triumph, but also a profound emotional 7)sympathy between the public of the most advanced nations of the world and the musical youth of Latin America, as seen in Venezuela, giving these audiences a message of music, vitality, energy, enthusiasm and strength. 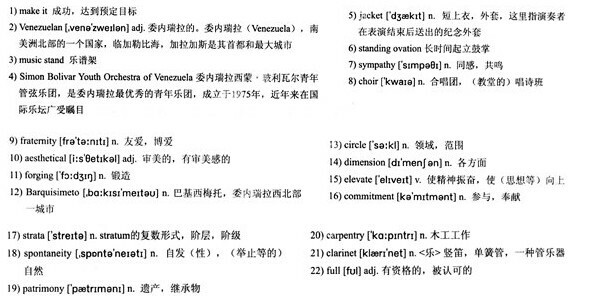 In its essence, the orchestra and the 8)choir are much more complex than artistic structures. They are examples and schools of social life, because to sing and to play together means to intimately coexist toward perfection and excellence, following a strict discipline of organization and coordination in order to seek the harmonic interdependence of voices and instruments. That’s how they build a spirit of solidarity and 9)fraternity among them, develop their self-esteem and foster the ethical and 10)aesthetical values related to the music in all its senses. This is why music is immensely important in the awakening of sensibility, in the 11)forging of values and in the training of youngsters to teach other kids. Each child in El Sistema has his own story, and they are all important and of great significance to me. We have a well-known case—Gustavo Dudamel. He started as a boy member of the children’s orchestra in his hometown 12)Barquisimeto. There, he grew as a violinist and as a conductor. 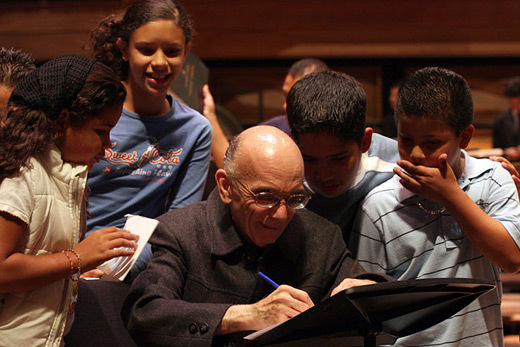 He became the conductor of Venezuela’s junior orchestras, and today conducts the world’s greatest orchestras. And he’s an unbeatable example for young musicians in Latin America and the world. The effect of El Sistema is felt in three fundamental 13)circles—in the personal/social circle, in the family circle and in the community. In the personal/social circle, the children in the orchestras and choirs develop their intellectual and emotional side. The music becomes a source for developing the 14)dimensions of the human being, thus 15)elevating the spirit and leading man to a full development of his personality. So, the emotional and intellectual profits are huge—the acquisition of leadership, teaching and training principles, the sense of16)commitment, responsibility, generosity and dedication to others, and the individual contribution to achieve great collective goals. All this leads to the development of self-esteem and confidence. In fact, the most miserable and tragic thing about poverty is not the lack of bread or roof, but the feeling of being no one, the feeling of not being anyone, the lack of identification, the lack of public esteem. That’s why the child’s development in the orchestra and the choir provides him with a noble identity and makes him a role model for his family and community. Within the family, the parents’ support is unconditional. The child becomes a role model for both his parents, and this is very important for a poor child. Once the child discovers he is important for his family, he begins to seek new ways of improving himself and hopes for a better life for himself and his community. Also, he hopes for social and economic improvements for his own family. All this makes up a constructive and ascending social dynamic. The large majority of our children belong to the most vulnerable 17)strata of the Venezuelan population. That encourages them to embrace new dreams, new goals, and progress in the various opportunities that music has to offer. Finally, in the circle of the community, the orchestras prove to be the creative spaces of culture and sources of exchange and new meanings. The 18)spontaneity music has excludes it as a luxury item and makes it a 19)patrimony of society. It’s what makes a child play a violin at home, while his father works in his 20)carpentry. It’s what makes a little girl play the 21)clarinet at home, while her mother does the housework. The idea is that the families join with pride and joy in the activities of the orchestras and the choirs their children belong to. The huge spiritual world that music produces in itself, which also lies within itself, ends up overcoming material poverty. From the minute a child’s taught how to play an instrument, he’s no longer poor. He becomes a child in progress heading for a professional level, who’ll later become a 22)full citizen. Needless to say that music is the number one prevention against prostitution, violence, bad habits, and everything degrading in the life of a child.